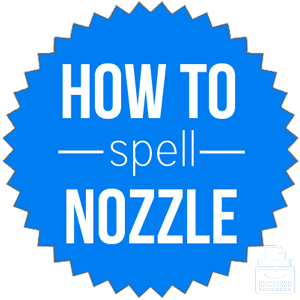 Spelling of Nozzle: Nozzle is spelled n-o-z-z-l-e. The plural form is spelled n-o-z-z-l-e-s. Definition of Nozzle: A nozzle is a projecting piece with an opening that regulates and directs the flow of a fluid, as at the end of a hose. Nozzle is also slang for nose, as in the feature of the face that bears the nostrils and nasal cavity. Pronunciation of Nozzle: Nozzle is pronounced naw-zul. What does nozzle mean? Nozzle is a noun. A nozzle can be a projecting vent of something or a short tube or spout that’s tapered or constricted so as to increase the velocity or direct the flow of fluid. There is usually a nozzle at the end of hoses, pipes, and tubes. His Halloween costume included a tube with a nozzle at the end, which, when opened, would release fake blood. The first setting on the nozzle of the water hose was too strong and it scared the dog. Nozzle is also a slang term for nose. How did you manage to get pen ink on your nozzle? She threw the ball and it hit me square in the nozzle. The word nozzle was first used in 1683, according to Merriam-Webster’s. Nozzle is derived from Middle English noselle, meaning a socket on a candlestick, and is the diminutive of nose. Alternate and earlier forms of the word include nozle, nosle, and nosel. Nozzle is a noun with two meanings. The first and primary definition of nozzle is a spout, vent, or short tube with a taper or constriction, as at the end of a hose, pipe, or tube, to control the flow of fluid. The second use of the word is as a slang term for nose.